If you would like to enroll in a Scuba Certification course, you couldn’t pick a better locale than the vacation paradise of Puerto Vallarta on coast of the massive body of water, Banderas Bay. 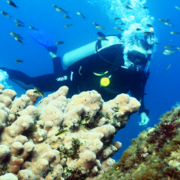 With serene transparent waters, bustling coral gardens, and amazing volcanic formations, Banderas Bay offers scuba diving enthusiasts an unequaled aquatic experience. A remarkable assortment of exotic marine species thrive in the teeming reefs along the islands and within the remote coves of Bahia de Banderas (Banderas Bay); prismatic fish species, Olive Ridley Turtles, Giant Pacific Manta Rays, and Moray Eels can be found in the Puerto Vallarta region. We provide the complete syllabus of PADI-sanctioned scuba diving instruction, including the popular courses: PADI Open Water Certification and PADI Open Water Referral. Whether you’ve already started instruction for Open Water Certification with your hometown dive center, or would like to go through the whole process with our expert scuba instructors, we have the program for you. Our scuba teachers offer in-class instruction and on-site testing, confined water practice in a shallow-water environment, and four open water dive trips to conclude your certification. We provide fully-customized dive vessels as well as well-maintained diving equipment for all of our clients. As well as Open Water Certification and Advanced Open Water Certification, we also provide a full assortment of specialty dive courses. 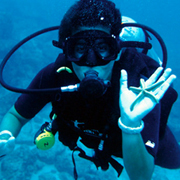 If there is a particular type of scuba diving training that you are interested in, but do not see on our website, make sure you phone our scuba diving experts on our toll-free number. Our patient bilingual dive instructors are waiting in Puerto Vallarta to help you complete your PADI Open Water diving Certification. Why not finish your training in the gorgeous waters of Banderas Bay? This body of water that borders Puerto Vallarta is a great environment for your four final open water dives. Our PADI-endorsed Open Water Diver program offers high-quality instruction for divers seeking to complete their certification. 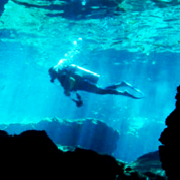 This course includes classroom and pool instruction, as well as open water dive trips. We'll teach you all the necessary skills to dive in open water all over the globe.